Macabre, disturbing, and exhilarating, Things We Lost in the Fire is a collection of short stories that use fear and horror to explore multiple dimensions of life in contemporary Argentina. From women who set themselves on fire in protest of domestic violence; to angst-ridden teenage girls, friends until death do they part; from street kids and social workers, young women bored of their husbands or boyfriends, to a nine-year-old serial killer of babies; and from a girl who pulls out her nails and eyelids in the classroom, to hikikomori, abandoned houses, black magic, northern Argentinean superstition, disappearances, crushes, heartbreak, regret, and compassion, this is a strange, surreal, and unforgettable collection that asks vital questions of the world as we know it. Short stories are my jam and this book is my new favorite. 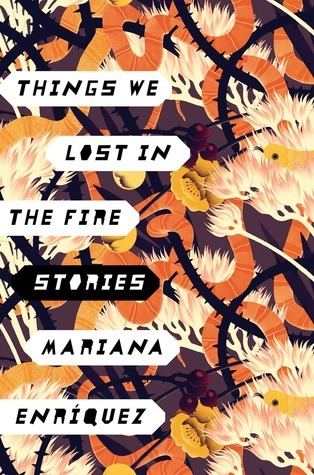 I absolutely LOVED Things We Lost In The Fire by Mariana Enriquez. Talk about a batch of creative and captivating stories that will haunt you for days. Set in Argentina, this book depicts modern day in a dark and twisty manner using history and myths to ground it. Topics such as life, death, relationships, poverty, feminism are explored against disturbing, eerie, and horrific monsters, ghosts, and the supernatural. It all makes for quite a suspenseful and terrifying read - and I LOVED every minute of it. Enriquez knows how to create a story that engages her reader with her sharp and creative writing, relatable characters and unique storytelling. She is a force and her book is fierce. My favorite stories were, Adela's House and The Inn. One's a tale of revenge and the other is about a seemingly abandoned house. Both are riveting and spooky - they linger in your thoughts and imagination for quite some time. I loved the eerie feeling that came with reading this book - it made for such a fun experience. I would happily recommend Things We Lost In The Fire to fans of short stories and fans of horror/thrillers - you will LOVE this collection of short stories! !